Our popular line of high quality mannequins is now available without heads. 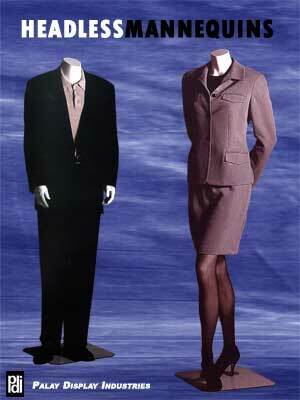 Our headless mannequins offer the same high quality as our full mannequins with the contemporary headless look. Please chat online or call and one of our knowledgeable representatives and answer any questions you may have about our headless mannequins. This Edgar Mannequin Hands Behind Back is the perfect addition for an attractive way to display clothing in your store windows and interior. Detachable arms, leg, hands, and torso makes this Edgar Mannequin easy to dress. This Edgar Mannequin Hands by Sides is the perfect addition for an attractive way to display clothing in your store windows and interior.